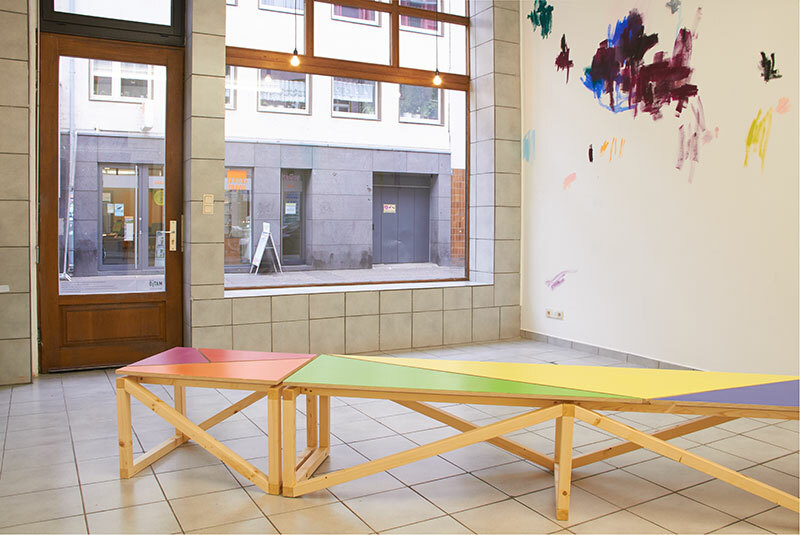 “Again Interpretation” was a site-specific and collaborative project that took plac in January 2017 at the Gallery Matjö of the Federal Association of Artists of the Fine Arts (BBK) in Cologne, Germany. 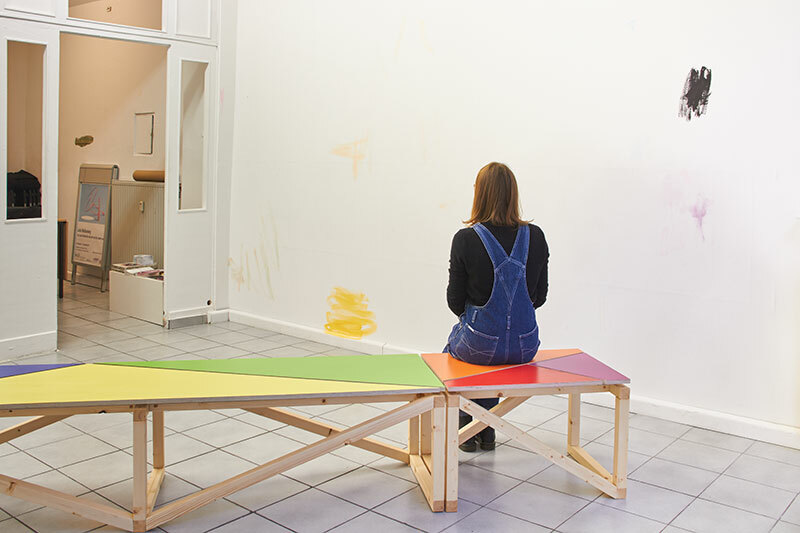 The idea was to create a platform for unmediated experience of art. As its paradigm this exhibition takes the contrast of experience versus intellectual reception of art. This contrast is reflected in both artists’ biographies, born and raised in Germany and and having received their art education both in Germany and New York and now living permanently in New York. The artists undertook this project as a conscious decision to reexamine their relationship to both German and American Art. The concept refers to Susan Sontag’s essay „Against Interpretation“ from 1961 and more general to Non-Relational Art of the 1960s. The question posed here is, if and how this cultural divide and contrast influences both artists’ work. 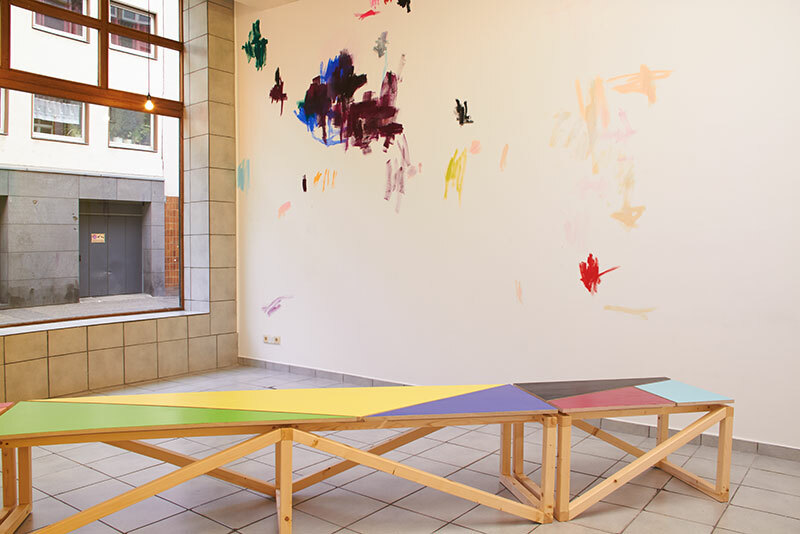 Deciding on a site in Cologne was a conscious choice: The project is informed by the exchange between artists from New York and Cologne in the recent past, which has impacted art making in both cities equally. American Art seen and interpreted through two German artists questions fixed conceptions of cultural identity. 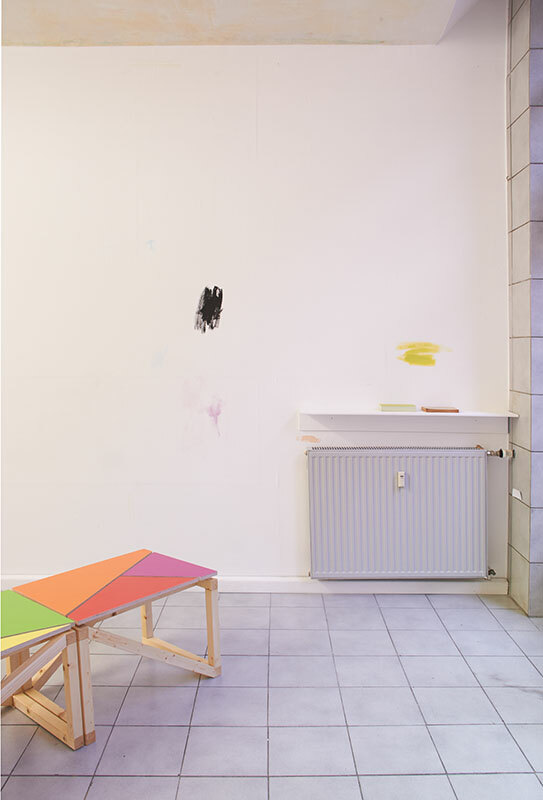 Both artists’ positions document a coexistence of these two different influences. 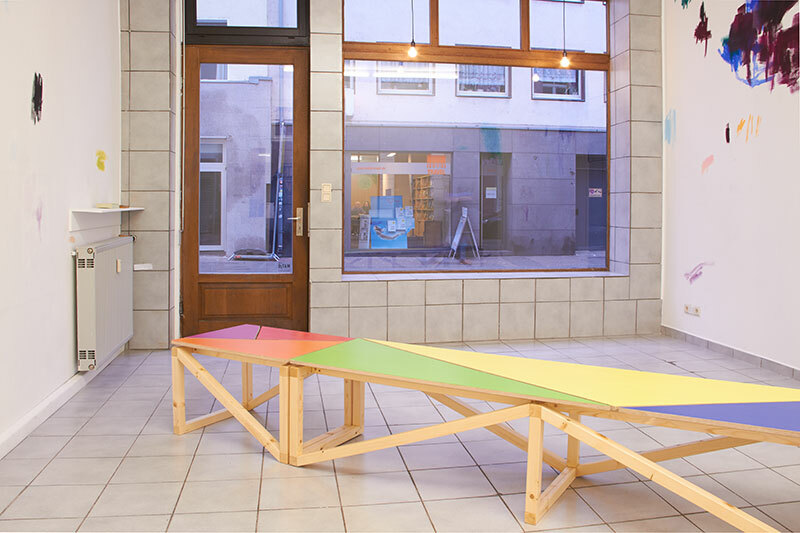 Björn Meyer-Ebrecht’s “Long Bench” refers simultaneously to art of Bauhaus and American Abstraction. It is his attempt to both generate and overcome language systems and create works, which function as signs and utilitarian object. 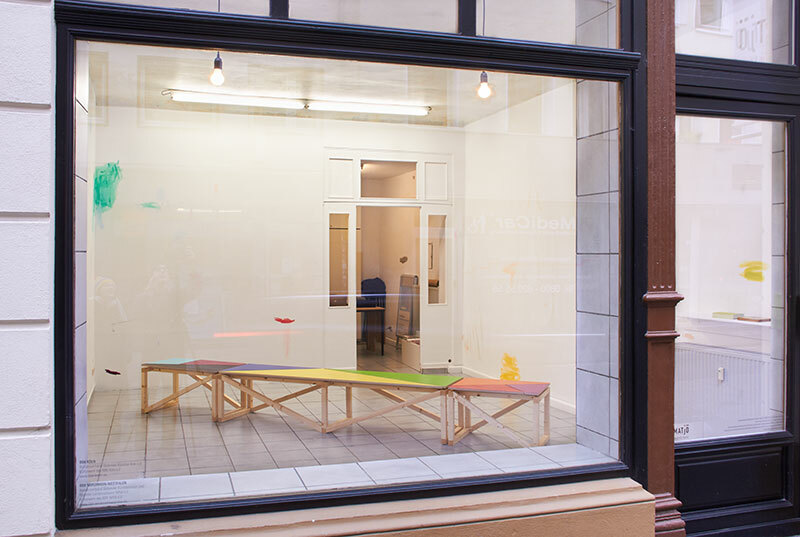 “Long Bench” is part of a series playing with the notion of display, creating seating arrangements in a gallery context as well as architectural displays of other artists’ work. 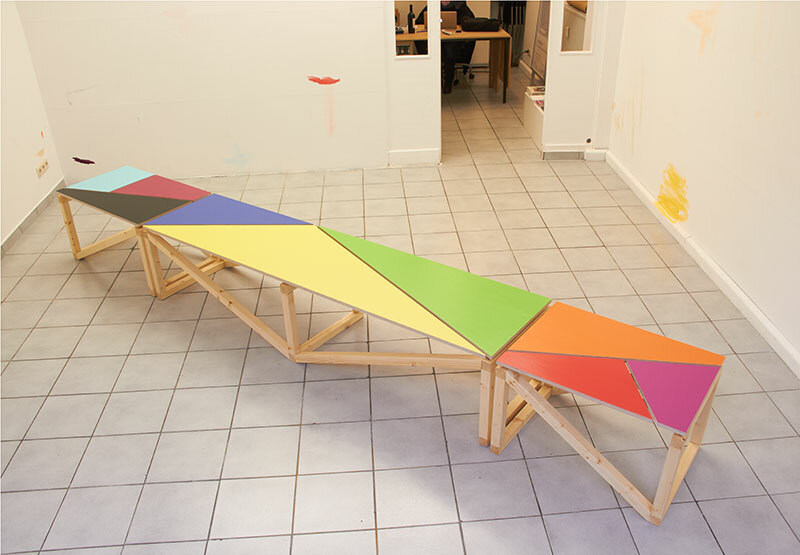 “Long Bench” was conceived in relation to the specific architectural space. 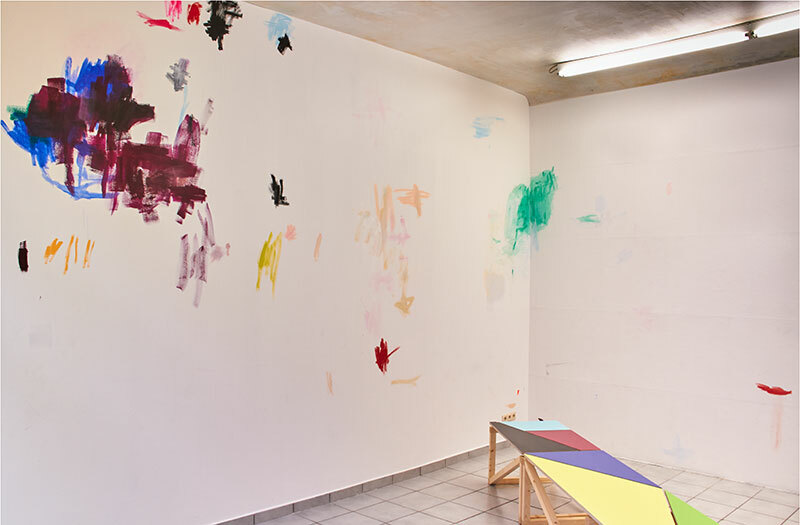 Diagonally dissecting the gallery, it serves as central vantage point from which Jule Korneffel’s wall painting can be viewed. In contrast to Meyer-Ebrecht, Korneffel’s work draws from the idea of unmediated experience, embodied in the act of painting. 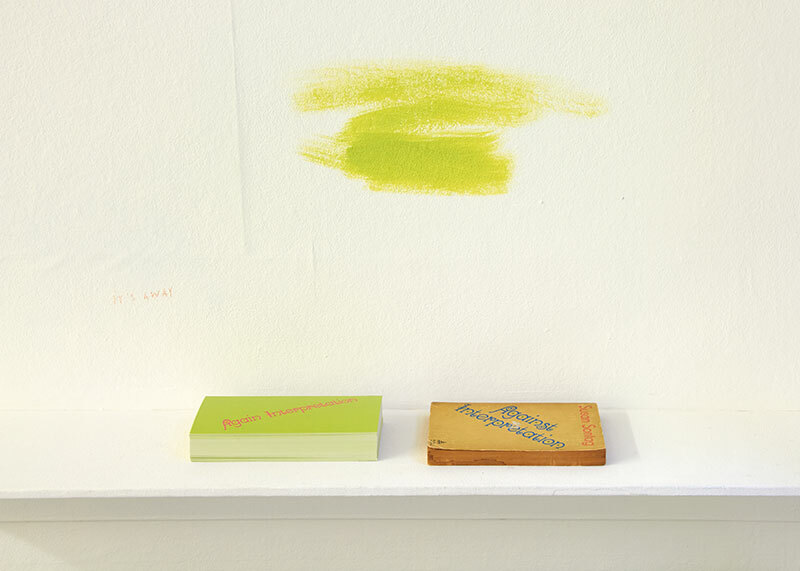 She sees her mark making as a record of the present moment as well as it is always burdened by accumulated knowledge of the history of painting. She understands painting as exploration of space, yet she is conscious of the painterly mark as a language both formed and informed by New York School and older European painting tradition. The desire to break free from the European origin appears as an infinite loop since composition is still to be found in the most incidental moments. This collaboration invited to experience and enjoy this interplay between the two artists, while engaging in a deeper conversation about the idea of unmediated experience, and the conceptual framework behind it. These questions was the focus of an artist talk scheduled during the show with the Art Historian Dirk Hildebrandt, who has extensively written about the relationship between American and European Art in the recent history.